Wash all strawberries and dry them out nicely. Then place them on paper towels till they get room temperature. Now melt corn syrup, chocolate chips and butter in a double boiler by occasionally stirring them. 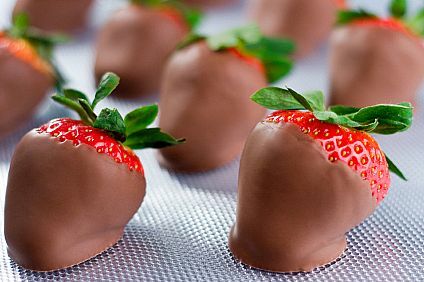 Once it is completely melted, remove it from heat and dip strawberries one by one into melted chocolate, coating two-third of strawberry with chocolate. Hold on the strawberry for some time to allow excess chocolate to drip off back into the pan. 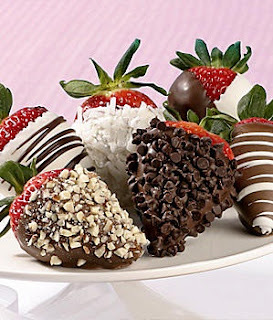 Place dipped strawberries on a baking pan that is covered with a waxed paper or cookie sheet. Refrigerate them for 15-20 minutes until they are set. Mix bittersweet and semisweet chocolate in a microwave-safe dish. Microwave it for 1 minute, then remove and stir. Again microwave it for an additional 30 seconds and again remove and stir. Repeat this process until the chocolate is melted completely and give a smooth texture. Now, line a sheet pan with a wax paper. 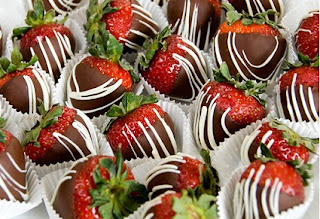 Hold the strawberry by its stem and swirl it in chocolate for coating of whole strawberry except a little portion beneath the stem and allow excess of chocolate to drip back in the bowl. Repeat the process for all strawberries. Melt white chocolate and dip fork points into it and then drool and swirl into dark chocolate making a superb pattern. Lastly, allow them to harden at room temperature and then refrigerate them until they are set. Take the chocolate in a double boiler and keep over the sauce pan containing hot water. Continuously stir to melt the chocolate nicely. Now add the liqueur, butter, cream and heat the mixture and stir until the texture of mixture becomes smooth. 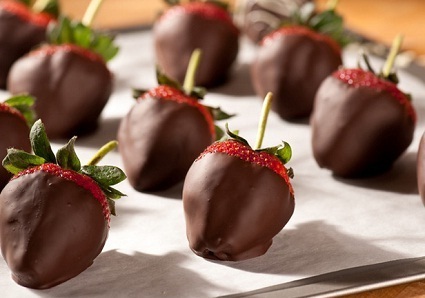 Dip the strawberries in the chocolate mixture. Place them on a dish lined with wax paper and place it in refrigerator until they are completely set. Before you start preparing, make sure that the strawberries are nicely washed and fully dry. Now, melt the dark chocolate in a microwave-safe bowl on setting the microwave on high for about 1 minute. Then add half of the whipping cream in the melted chocolate and again place it in microwave for few seconds until they combine properly. Beat the mixture well. Take the strawberries one by one, hold carefully with the stems, and dip it in the sauce. Shake it well to cover whole of the strawberry with chocolate. Then hold it for few seconds so that excess sauce will drip back to the chocolate mixture. Place them in the baking sheet and allow them to dry. Now, take white chocolate and melt it in another bowl by following the same procedure that you did for the dark chocolate. Again beat the mixture well. 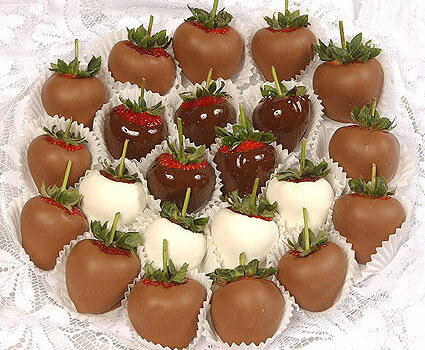 Now cautiously dip the one-fourth part of dark chocolate covered strawberries in the white chocolate sauce. Hold it until the excess sauce drip off. Again place them on wax paper to dry. Decorate them by sprinkling almonds, nuts or coconut and freeze in refrigerator until they are set. Prepare a cookie sheet with waxed paper. Heat white baking chips with 1 tbsp shortening in two-quart saucepan over low flame, stir constantly, until all chocolate chips are melted completely. Poke fork or toothpick into stem end of each strawberry one by one, and dip 3-4th part into melted chips, leaving the top portion and leaves uncoated. Place them on the prepared cookie sheet. Now, heat semisweet chocolate chips with 1 tsp shortening in one quart saucepan over low flame, stir constantly, until chocolate chips are melted completely. 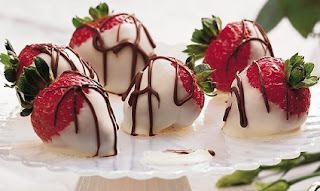 Once the chocolate sauce is ready, drizzle it over dipped strawberries with the help of a small spoon. Then, refrigerate uncovered for about 30 minutes until it is set.